1. Modern day people wearing long Renaissance capes. 2. Going to school and seeing crazy hair lady doing yoga in the hall way. 3. The fact that I am spelling English words with German spelling now. 4. When my cat starts to make barfing noises. 5. When someone start talking to me in German on the street. But I must say I am now starting to understand them. 6. When I watch Lost. 7. When I smell someones fart in the Metro. I don't know why but this is very weird for me. Let me give you an example piece of Andreas. Andreas is one of three of our teachers at school. He is probably the most German man I have ever met. 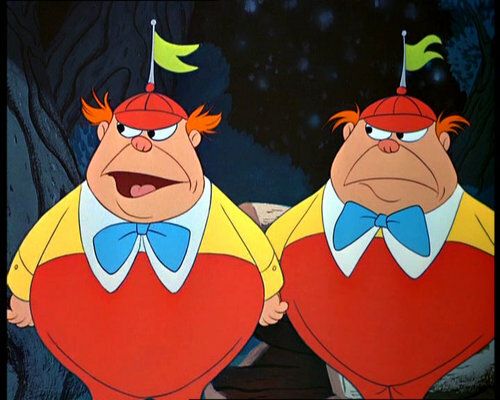 Physically speaking the best I way can describe him would be comparing him to Alice in Wonderland's "Through the Looking Glass" characters Tweedle dee and Tweedle dum. Take Tweedle dee or Tweedle dum, doesn't matter because they look the same, strip him down, put some Wrangler jeans on him, a Bill Cosby sweater, a mullet, and there you have Andreas. The reason I said he was the most German man I have ever met is not because of his physique, but rather his voice, communication, and I dunno he's just so German. In class, our teachers are not aloud to speak English at any point...period. What I have observed is that Andreas thinks the louder he speaks, the better we will understand. Don't get me wrong, he is actually one of my favorite teachers but I am probably the only one who think so. No matter. This kind of communication creates a lot of frustration for anyone who wants to ask a question in English about grammar, vocab, etc etc. Take Heidy for example. Heidy is from Egypt. She is hilarious and probably one of the most kind people I have ever met. She speaks very little English and even littler German. So, when she asks a question, five minutes later she has just created the first word of her question. This is the overall frustration of the class that makes everyone a bit uncomfortable. Unlike the other teachers, Andreas like to talk...a lot. For me this is good because I like to figure out new words, and hearing it so loud and pronounced helps me in understanding where words end and begin. Even if I don't understand the meaning. But overall the feeling I am getting after Andreas leaves the room is that my class either wants to a) construct a plan to get rid of him, or b) murder him.